Practice sustainable forestry. Alpena Hardboard foresters, in the written forest management plan, outline ways to practice sustainable forestry. It is the landowners responsibility to gain an understanding of good forest management and make decisions that perpetuate sustainable forests. Approve and follow the written management plan prepared for you. 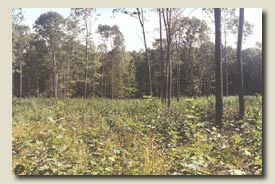 It is the landowners responsibility to follow the suggestions identified in the management plan to practice sound forestry. Allow Alpena Hardboard the opportunity to make an offer to purchase your timber when a harvest is warranted. There is no charge for the forestry services offered in the Forest Management Program, but we do ask that we be given the chance to purchase any timber harvested. Know property boundaries. It is the landowners responsibility to know property boundaries and corners. Alpena Hardboard foresters can mark some property lines, but landowners are generally responsible for identifying the lines.